History of Precision Tube Bending – Our 56th Year! Precision Tube Bending and Engineering Company was founded by William “Bill” Mayo and Robert Benny on February 12, 1957, during the infancy of the production of the first military and commercial jet propelled aircraft in the United States. The Initial location of the company was 8036 Airport Drive in Santa Fe Springs. This was a prime location to support the emerging military and commercial aviation markets on the U. S. West coast, from San Diego to Washington state, with a concentration of aircraft companies in the Los Angeles area. Bill Mayo purchased his partner’s interest in the company on January 1, 1960. The company was incorporated in 1962 and the name was changed to Precision Tube Bending. Bill was an innovator and entrepreneur in the truest sense of the words. His passion for the highest quality products quickly gained the attention of the local aircraft and aerospace companies. 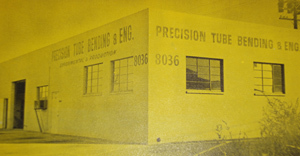 Precision Tube Bending’s reputation for quality and on-time deliveries provided the basis for quick growth. PTB became known as the aircraft tube benders and aerospace tube benders of choice. High Quality products and excellence in service to customers were foremost in Bill’s mind every single day. A major strength of Bill was his ability to attract highly motivated employees and PTB became known as a great employer that recognized the value of talent and work ethic of their employees. The management of PTB invested heavily in employee training and fostering the importance of customer satisfaction at all levels of the company. The aircraft and aerospace industries were growing rapidly with increased demands for high quality pneumatic ducting systems to support ever increasing pressures and temperatures. 1976, the company moved into a new 60,000 square foot manufacturing facility located at 13626 Talc Street in Santa Fe Springs (the current location). Bill, “the innovator” concentrated on perfecting “bends” to achieve large diameter tube bending (10 inch maximum diameter) and tight radius tube bending (1 D bends). Precision Tube Bending became well-known for custom and complex tube bending and tube fabrication requirements. This move to the new facility enabled PTB to add capabilities for manufacturing complete aircraft tube assemblies; aircraft duct assemblies, aerospace tube assemblies and aerospace duct assemblies. CNC tube bending machines were added to a full size range of mandrel tube bending machines. Bill lost his 3 month battle with cancer and passed on in June of 1980. At that point in his life Bill had earned a reputation in the aircraft and aerospace industry as a leader in the development of precision tube bending technology. Bill’s daughter, Diane (Mayo) Williams, succeeded him as president of the company, and remains as the leader of the company today. Diane has continued to invest heavily in both employee talent and state of the art equipment. PTB has received many industry awards and is one of the leading Women owned-small businesses in the U.S. Aircraft and Aerospace industry. Today, Precision Tube Bending is following the vision of Bill Mayo in providing the highest quality precision tube bending products available in the industry. Excellence in quality and customer service remains the most important focus of PTB.